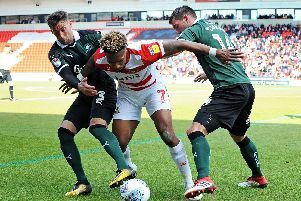 Doncaster Rovers: What lesson did Darren Ferguson learn from last season’s title collapse and why does he feel current dip in results is different? Darren Ferguson says he has learned from last year’s end-of-season collapse but is at pains to point out that his side’s current dip in form is very different. Doncaster Rovers threw away the League Two title this time last year by losing their last four games. Looking back, Ferguson regrets not rotating his squad and freshening up his team - something he is doing at present. Rovers travel to relegation-threatened Oldham Athletic tomorrow following their first back-to-back league defeats since September and a disappointing 3-3 draw against Bury. But Ferguson says his side’s dip in results is not comparable to what happened last season. “I think everyone could see the effort and application the players put in against Blackburn,” he said. “It’s not like last season. “I’ve said to the players we can’t finish like last season. “We’ve got to try and get some wins because then it doesn’t reflect on the whole season, which would be unfair on the players I feel. “Everyone wanted to speak about what happened at the end of last season, rightly or wrongly. “We’re conscious of the fact we want to get some wins before the end of the season. “But I think it’s different to the end of last season, I think you can see the energy in the performances and the effort they are putting in. “They’re doing all they can to win games of football. “And perhaps last season, what happened there, maybe it’s the motivation not to let that happen again. “I felt the same as everyone else who watched us last season. We went from one team to a totally different team, we just dropped off. “I definitely feel that I need to freshen it up game by game, I’ve got to get energy into the team.